I hit the 800 day point on my Duo streak today. I know that's still minor league compared to some of the long-timers, but it's a long time for me. Congratulations on the consistency of your practice ... Well done. Congratulations @MikeNolan6! 800 Day Streak is a milestone for you and me! I am only 51 Day streak. Please take this lingot. Check my Discussion "50 Day Streak". Minor? It's magnificent. Enjoy the moment. I lingot you in congratulation. Boy, would I love to see my streak at 800. I can't imagine the pure dedication that you have. Please, take this lingot. @buck72, that is a LOT of languages wow!!!!!!!!! Your family is safe today! Well done on a fantastic achievement . I passed that same milestone a few days ago. Congrats to you too, then, SimonJeffe! Do you feel over these 800 days, that it has helped you in a tremendous way? Can you speak those language well now? I know enough French that I've started reading the Harry Potter books in French, and have plans for other books. Eventually I'd like to read some of the classics of French literature in French, but books like Les Miserables use tenses that are seldom used these days, even in written French. As to conversing in French, I don't really think those are skills Duo excels at teaching. I have using Duolingo to refresh three languages - French (from school), German (from uni) and Polish ( have a Polish wife). I still use online dictionaries and grammar books to help out as well. I found that Duolingo has definitely made a difference, in that I can now speak and understand all three languages much better again. 800 sounds very significant to me. Good job! Keep it up. Minor?! It's HUGE you should celebrate! WOW! That is a huge accomplishment! WOW, my parents have been married over 40 years too, congratulations! you have motivation, thats good!! That's totally awesome! Congratulations! And trust me, that is NOT minor. I just started, I haven't even been here for a week yet, you're doing awesome! Just spent my lingots, but I'll throw a few your way tomorrow! Such a wonderfully wonderful effort. Congrats. That’s a long time, congrats. congrats!!! wow!!! not minor at all!!! Me too! Let us both try to make it to 1000. 820 days is an awesome achievement as well! Well done to you! You started one day after me! 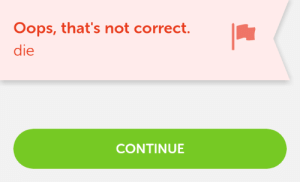 Are you still enjoying Duolingo? My next challenge will be the new Latin course when it arrives! Can’t wait! Hi Simon, yes I still enjoy Duolingo very much. I started Turkish lately and it's pretty demanding :) Good luck with your studies and congrats for your streak too! I took 2 years of Latin some 50 years ago, I might dabble with that one myself. Mike, that is fantastic, keep it up! Yoor streak is even more amazing! Great stuff! That is 26.3 months or 2 years, 2 months that is ABSOLUTELY AMAZING. Holy moly way to go. I’m proud of my 75 pidly days hoping to make 100 then 183 or 6 months. I say yell it from the rafters you have A LOT to be proud of. I have a quick question: at that high of a streak, can you literally just buy streak freezes everyday using the rewards for continuing the streak which replenish your lingots? A streak freeze costs 10 lingots, so it would cost 100 lingots to buy 10 days worth of streak freezes. I only got 80 lingots for hitting 800 days. I have enough lingots built up that I could buy 387 days of streak freezes, so it's technically possible for me right now. Now, once someone hits 1000 days, anyone could do it, even if they don't have a stack of lingots in the bank. But you'd have to log in every day to extend the streak, so why not just do a lesson instead? Why is your profile picture of some potatoes? Congratulations. I'm at a mere 75 days. I've started, stopped, and restarted at least a half dozen times. I'm started to get the hang of this now. 800 seems like a long way away. Great work! Félicitations!! J'espère atteindre ce niveau moi aussi un jour, mais je commence encore :) ! One day at a time. That's how you build a long streak. I only have a 52 streak. Respect! WOAH!!!!!!!!!!!!!!!!! 800? How did you do that? 800 Days and My Quiz Scores! 800 Days and Level 25 in Italian!